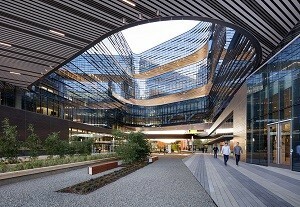 Everyday Samsung employees enter their new San Jose R&D/Sales headquarters. They see a modern building covered with 22,000 square foot of porcelain tile and 1,350 square feet of stone fascia and caps. Once inside, they walk along 48,000 square feet of porcelain tile in towers, lobbies, elevators, restrooms, and meeting spaces. Superior was pleased to be part of the Samsung headquarters project team led by NBBJ (architect) and Webcor Builders (general contractor). 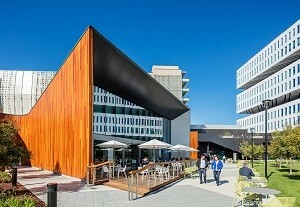 With a total of 1.1 million square feet, the new LEED-certified Silicon Valley Headquarters includes a white metal, glass and terracotta exterior, a parking structure covered in a folding green-colored wall, and courtyards that include fitness facilities, artwork and cafes — some of which will be open to the public. Take a virtual tour through Samsung’s North America headquarters, completed in 2015. View the NBBJ Samsung headquarters pictorial for a full set of images. This entry was posted in Commercial Buildings, LEED and tagged Commercial Tile Installation, design, Fabrication, LEED, Samsung, stone installation. Bookmark the permalink.